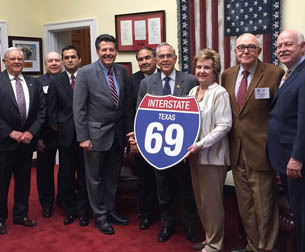 More than 20 representatives of Texas communities and two members of the Texas Transportation Commission were on Capitol Hill in April urging federal officials to continue and accelerate the ongoing development of Interstate 69. 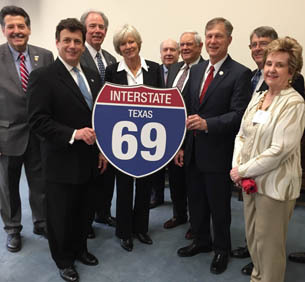 The Texas delegation lead a larger group of representatives from states on the I-69 national route including Louisiana, Arkansas, Mississippi, Tennessee, Kentucky, Indiana and Michigan. Leading the Texas delegation were Jeff Austin of Tyler and Jeff Moseley of Houston, two of the five members of Texas Transportation Commission. They were joined by mayors, county judges, port authority representatives and local officials from Texas communities. Participants provided a state-by-state progress update to the I-69 Congressional Caucus which includes Members of Congress from all of the eight states along the I-69 corridor. The delegation heard remarks from Congressman Bill Shuster, Chairman of the Transportation Committee. During their visit the delegation also met with individual members of Congress and with U.S. Department of Transportation officials. 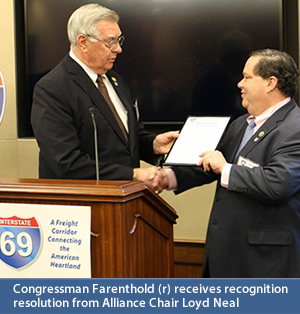 Congressman Blake Farenthold of South Texas was recognized by the Alliance for I-69 Texas for his leadership. He is the co-chair and founder of the I-69 Congressional Caucus. Farenthold is members of the House Committee on Transportation and Infrastructure, as are Congresswoman Eddie Bernice Johnson of Dallas and newly-elected Congressman Brian Babin of Woodville. 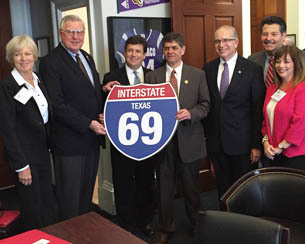 Loyd Neal, County Judge of Nueces County and board chairman of the Alliance for I-69 Texas, said the objective of the delegation's efforts in Washington was to encourage Congress to enact a highway reauthorization bill that is long-term and provides increased funding for highway projects including I-69. 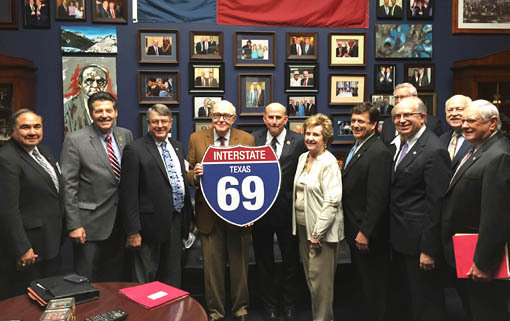 The I-69 delegation presented a set of priorities they would like to be considered in a new highway bill. These include protecting gains made in the last bill – called MAP-21 – such as environmental streamlining provisions and increased flexibility for states in how they allocate funding. They are also seeking expansion of innovative financing options that are now part of the law. Priorities for Texas include providing greater flexibility in interstate designations in rural area and the designation of State Highway 44 from Freer to SH 358 in Corpus Christi as a future system connector within the I-69 federal high priority corridor. This initiative is sponsored by Congressman Farenthold. Interstate 69 in Texas is being developed as a series of incremental upgrades to existing highways – US 59, US 77 and US 281. A total of 205 miles of the I-69 system route in Texas have now been designated as part of the Interstate Highway System. The latest addition was 11.9 miles of US 59 through the center of Houston. Since 2010, the Texas Transportation Commission has programmed a total of $1.3 billion in funded I-69 system projects that have been built or will be completed over the next few years. This includes 12 more projects with a total estimated cost of $219 million approved in February. Delegation members meet with Congressman Louie Gohmert of East Texas. DOWNLOAD multi-state presentation materials from the 2015 I-69 DC Fly-In at our RESOURCE CENTER. TxDOT Commissioner Jeff Austin and Texas delegation with newly-elected Congressman Brian Babin of East Texas. 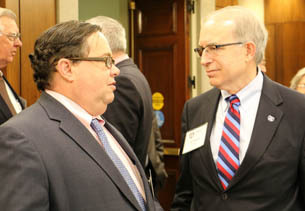 Congressman Farenthold (l) and TxDOT Commissioner Jeff Moseley. Delegation meets with Congressman Ruben Hinojosa of South Texas. Delegation meets with Congressman Filemon Vela of South Texas.